Remember when the Atlanta Falcons announced they'd be building a new stadium—using a boatload of public money—that would be crowned with a retractable roof? The architects of the $1.2 billion project recently passed along a new fly-through of the design. And while it's our best look yet at the structure, it also brings up plenty of questions. The stadium's architect, 360 Architecture, was recently acquired by mega-firm HOK—which sent along their latest renderings of the stadium, currently under construction and planned for a 2017 opening. 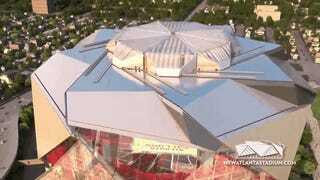 You'll remember that the first renderings of its unusual roof structure showed a cobweb of wispy metallic struts that seemed to open and close, and the Falcons are going through with the unlikely (and definitely wildly expensive) plan. Inspired by the oculus in the ancient Rome Pantheon, the stadium's unique roof opening will provide tremendous flexibility in hosting a wide variety of events in the stadium. Eight unique roof petals can open in less than eight minutes, creating a "camera lens-like" effect that exposes the inside of the facility to the open air on game and event days. The roof is constructed of ETFE fabric that, when closed, allows for translucent light into the stadium.